The optional Fluke DTX-SFM2 Fiber Modules are required. One module is required for the main unit and one for the Smart Remote. Each module has 1310nm and 1550nm laser sources combined into a single output port. Each module also has a Power Meter, 850, 1300, 1310, and 1550nm, and integrated VFL. 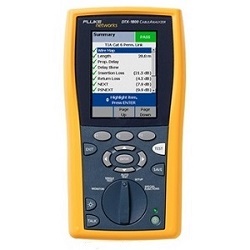 The optional Fluke DTX-MFM2 Fiber Modules are required. One module is required for the main unit and one for the Smart Remote. Each module has 850nm and 1300nm LED sources combined into a single output port. Each module also has a Power Meter, 850, 1300, 1310, and 1550nm, and integrated VFL.